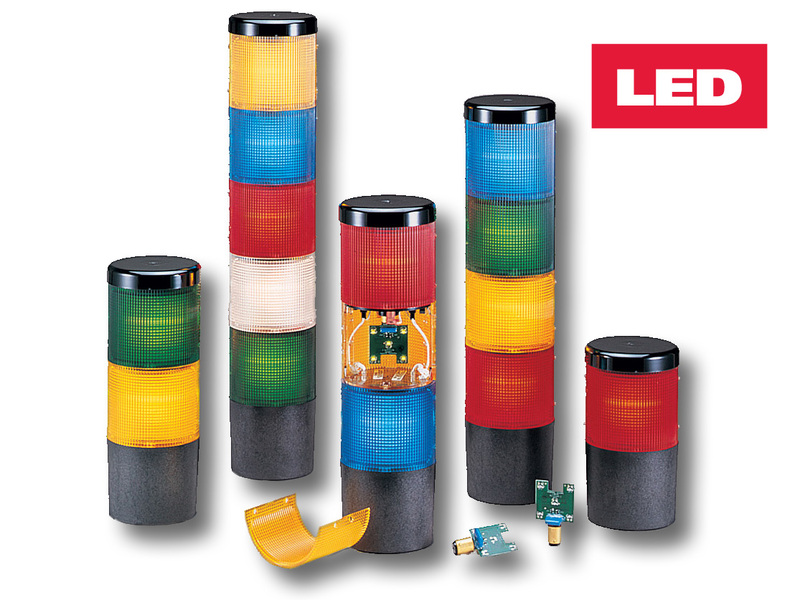 Federal Signal’s Litestak® status indicators are vertical columns of light that indicate status in a full 360° radius. The Litestak Model LSLD modular indicator light system allows the user to combine up to five interchangeable lamp units with a base power unit. Modules are sold separately for a truly customized indicator. Light modules come complete with a 50,000-hour LED lamp; LED light output coordinates with the module’s impact-resistant polycarbonate lensing. LED lamps consume less power, operate at a lower temperature, and are remarkably resistant to vibration, which makes them perfect for use in heavy-duty, high vibration applications. An optional Sound Module (Models LSS or LSH–on page 24 and 26) can be added to the top of the Litestak column to create a dual purpose audible/visual status indicating signal. The LSS sound module allows the user to select from 32 tones via a simple dip switch panel. In applications where a single loud tone is all that is necessary, the LSH piezo-electric horn is a perfect audible addition. Litestak is a versatile system that allows the user to select either steady burn or flash. A flasher is included on the 120VAC LSB unit only but can be purchased separately for 24VDC models. The Litestak base unit can be either surface mount or 3/4-inch NPT pipe mount. All Litestak models should be mounted base down.